Excruciating. Offensive. Heartbreaking. And yet familiar. Many women who watched Christine Blasey Ford testify before the Senate Judiciary Committee on Thursday about her alleged sexual assault cringed through her questioning and identified with the witness more than they might have expected. “She feels familiar because we’ve either all been in a situation that she’s been in or know people,” said Alexis Wolfer, a Harvard Business School MBA candidate and copresident of the Women’s Student Association. Familiar, too, since many people watched a very similar scenario play out 27 years ago when Anita Hill raised allegations of sexual misconduct against another nominee for the Supreme Court, Clarence Thomas. Though the Judiciary Committee now includes four Democratic women, it is still dominated and run by older men, who brought in a female attorney to question Ford on their behalf. “It just feels like the scale of power was so obvious and so saddening,” Wolfer said. Ford’s late-breaking allegation of a decades-old sexual assault was infuriating to Republicans, who dismissed it as political gamesmanship by liberals intent on derailing the confirmation of conservative Supreme Court nominee Brett Kavanaugh. But many women were watching the performance with jaws dropped, amazed that a year into the #MeToo movement, after women everywhere began exposing the commonality and enduring secrecy of sexual misconduct, so many committee members showed they are still disinclined to believe women. “I have such deep respect for this woman who did not have to come forward, has no motivation to do so, and is shouldering the weight of so many survivors right now,” said Debra J. Robbin, executive director of Jane Doe Inc., a Massachusetts coalition against sexual assault and domestic violence. In interviews and on social media, many women raved about Ford’s poise during the high-octane hearing; Kavanaugh, during his testimony, repeatedly choked up or broke down in tears. Many women were relieved that she came across as a credible witness and dismayed that she was described by Senator Orrin Hatch, a Utah Republican, as an “attractive” witness. Wolfer was struck by how much time Ford’s supporters on the committee spent talking about her credentials, as if only someone with that education and those accomplishments could be believed. Ford, a professor of psychology at Palo Alto University and a research psychologist at Stanford University, peppered her testimony with references to “sequelae” and the hippocampus. Joan A. Moon, a public policy master’s degree student at the Harvard Kennedy School, said women who lack such credentials could have an even harder time establishing their claims. “They feel powerless, and it’s because of issues like this where women are constantly asking to be believed,” Moon said. Some women lauded Ford as a hero, posting a photo of her raising her right hand to swear in for her testimony. “When I saw this image on the live stream . . . I was struck by its instantly iconic nature. Her courage takes my breath away every time I look at it,” tweeted Alicia Daniel of Revere. Going into the hearing, Gouveia said, she was most concerned about whether Ford would be able to convey both her perceived obligation to testify and her own personal fear of it. That was what resonated with one Kennedy School master’s student who said she had a similar experience of sexual assault when she was in sixth grade. The student, who asked to remain anonymous because of potential professional repercussions, said she was given alcohol by an older boy unknowingly and then raped at a small gathering at a home. 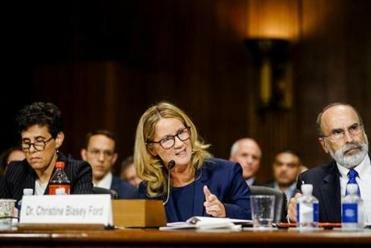 The way Ford described her own experience rang true with the Harvard student, the way certain details were seared in her mind and others completely forgotten. For Ford, it was the laughter of the boys who attacked her; for this student it was a painting on the wall she stared at as it happened. “Almost everything she is saying, I can completely parallel that with what I’ve gone through, so to me it feels very credible,” she said. “From someone who’s been through it, that made complete sense,” she said. The student said the past week and a half, as the allegations have come out, have been tearful. But she said watching Ford testify before the entire country was empowering. “I’m so proud of her for doing things I have not,” she said, acknowledging that — like many victims — she never reported her assault. “I’m hoping that seeing someone on the news giving this kind of testimony gives other people the strength and the courage to speak up, and only by speaking up will these things stop happening,” she said. For many survivors of sexual assault, the hearings stoked trauma or concern. Some victims’ hot lines were lighting up with callers yesterday, she said, as women who had been victimized reacted to the testimony. C-Span, which was live-streaming the hearing, received calls from women telling of their assaults for their first time. The most devastating thing now would be for the Senate to confirm Kavanaugh after hearing Ford’s account, said the student survivor of sexual assault.